As promised in the last column, this month’s discussion will focus on repotting orchids that do not have rhizomes, specifically phalaenopsis (phals). Phals store water in their roots and so need moisture on a regular basis. This requires different culture than other orchids and a different approach to repotting. Phals are generally repotted when they finish blooming, i.e. now, if they need it. Phalaenopsis are the most common orchid around these days and often the first one new hobbyists try to grow. When purchased, they are usually in a plastic pot in sphagnum moss, but can be found in almost any medium. 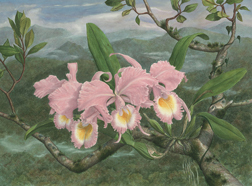 In nature, phals have roots more characteristic of cattleyas because they grow as epiphytes attached to trees, where roots dry out between rain events. Mounted or in a course bark medium, phal roots are hard and resistant to drying, unlike the nice soft roots found in peat or other wetter media. Roots on phals grown in sphagnum will not easily adapt to epiphyte-like conditions, nor will roots grown in a course, dry medium adapt to sphagnum. Roots of both will die if the type of medium is changed, although new roots will grow and establish in any medium. This will, however, set the phal back. Phals grow new roots to supply each new leaf with water and nutrients. The loss of roots from repotting will result in the loss of leaves near the base of the plant. The first step in repotting is to determine if your phal actually needs to be repotted or can wait another year. If your phal has started losing its lower leaves then it likely needs to be repotted because roots have died indicating poor media. If the phal has been in the pot for a couple of years it needs to be repotted. Phals will grow in just about any medium as long as you adjust the watering and fertilizing regimen to suit the new medium, but for best results, do your best to match the new medium with the old. Most of the big box stores sell small quantities of Sphagnum moss. To begin, soak the medium and remove the phal from the pot. I prefer to leave the old flower spike on the plant so that there is something to hold during repotting. Often new roots are also emerging now at the base of the plant and holding pressure there could damage them. Gently shake or wash the old medium from the roots so roots that remain are nice and white. Use a gentle jet from your garden hose. Remove black or soft roots, which are dead. If most roots are white and thick it is possible to place the phal back in the same pot. Put some plastic peanuts right under the stem and then carefully work the sphagnum in and around the roots. Wet the sphagnum first and then squeeze water from it before packing around roots. The object is to secure the phal in the pot firmly. If many of the roots are dead, use a sterilized blade and remove all but the white firm roots. You should cut the live roots off, 4-6” length if you are changing to a new medium. This will encourage new roots to grow in the environment of the new medium. Cutting off live roots is hard to do, but necessary if you change media. Sprinkle cut and damaged roots with cinnamon powder. It is a natural fungicide.